The Navy’s 6th Expeditionary Fast Transport (EPF) has completed its last set of trials ahead of delivery to Military Sealift Command, Naval Sea Systems Command (NAVSEA) annouced on Monday. 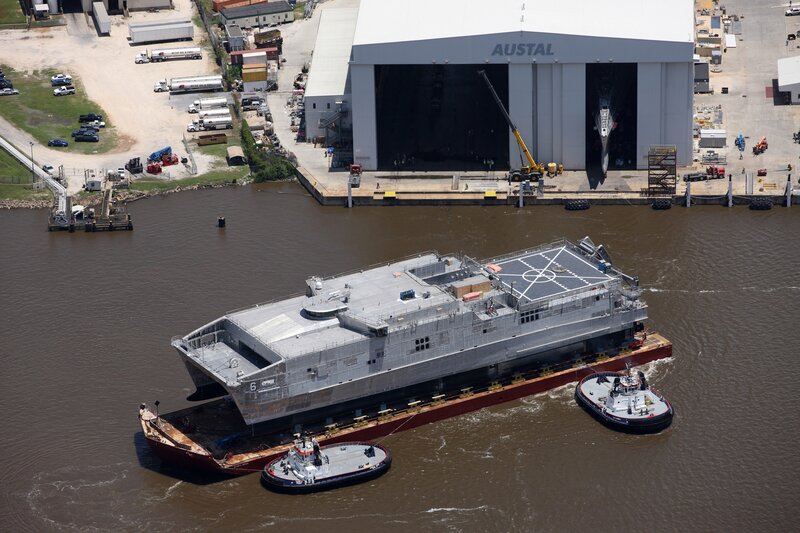 Now the Austal USA-built Brunswick (EPF-6) — of the class formerly known as the Joint High Speed Vessel (JHSV) — is expected to deliver to the service later this year. “Conducting acceptance trials is a major milestone for the shipyard and the program office,” said Capt. Henry Stevens, Strategic and Theater Sealift Program Manager, Program Executive Office, Ships. The trials in the Gulf of Mexico, “included dockside testing to clear the ship for sea and rigorous at-sea trials during which the Navy’s Board of Inspection and Survey (INSURV) evaluated and observed the performance of EPF 6’s major systems,” read the statement from NAVSEA. The class was designed to conduct intratheater lift and humanitarian assistance/disaster relief (HADR) support but has also been tapped to fill gaps in U.S. Southern Command’s counter-trafficking operations. The Navy has created an Auxiliary Platforms and Payloads Council looking at ships like the EPFs to optimize the service’s logistics platforms for new uses. Last week Austal USA was awarded a $53.4 million contract for long lead items for an 11th EPF further extending the original class of ten ships. The following is the complete Nov. 2, 2015 release form NAVSEA on Brunswick acceptance trials. MOBILE, Ala. – Expeditionary Fast Transport (EPF) 6, the future USNS Brunswick completed Acceptance Trials Oct. 23 the Navy reported today. The ship, which was constructed by Austal USA, is the sixth ship of the EPF class. The EPF class ships were formerly known as Joint High Speed Vessels, or JHSVs. The ship’s trials included dockside testing to clear the ship for sea and rigorous at-sea trials during which the Navy’s Board of Inspection and Survey (INSURV) evaluated and observed the performance of EPF 6’s major systems. Completion of Brunswick’s Acceptance Trials signifies that the ship is ready for delivery to the fleet in the near future. EPFs are versatile, non-combatant, transport ships that will be used for fast intra-theater transportation of troops, military vehicles, and equipment. EPF is designed to commercial standards, with limited modifications for military use. The vessel is capable of transporting 600 short tons 1,200 nautical miles at an average speed of 35 knots, and can operate in shallow-draft ports and waterways, interfacing with roll-on/roll-off discharge facilities, and on/off-loading vehicles such as a combat-loaded Abrams Main Battle Tank. Other joint requirements include an aviation flight deck to support day and night aircraft launch and recovery operations. EPF 6 will have airline style seating for 312 embarked forces, with fixed berthing for 104.